This Japanese snack uses specialist ingredients that are widely available in oriental stores and the ‘posh’ sections of supermarkets. It’s an easy, tasty and sophisticated dish that goes well with chilled oriental beer. Serves 1 to 4 – just increase the quantities if you are feeding a crowd. 1. Mix together miso, mirin, sake, egg yolk, spring onions and salt. 2. Place the mochi on a greased baking tray, and grill on both sides under a moderate heat until they are puffed up and golden brown. Take care not to burn them. 3. Spread each mochi with the miso mixture, and sprinkle with sesame seeds. 4. Return the mochi to the grill, and cook until the miso mixture is heated through. Serve immediately as a hot snack. Thank you! It’s one of the most popular recipes on this site, and seems to be attracting a huge number of readers. I’ve just discovered your blog – it’s very beautiful! I’ll sit down and read it properly tonight. This says “adaptable for vegans” — Can the egg yolk simply be left out, or should something be substituted? I finally cracked my bag open this morning after letting it sit for over a year in the pantry. The first plain grilled one was tasty, but I needed a little more something. Thanks for the yummy looking recipe. The egg yolk in the topping makes the grilled mochi puff up more, giving it a fluffier texture – for instance, think of the cheese topping on cheese on toast or grilled cheese. However, you can leave it out without affecting the flavour much. 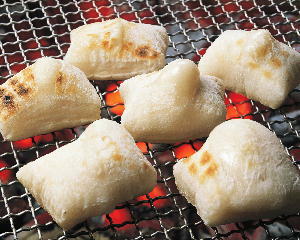 You can also float plain grilled mochi in miso soups (a bit like croutons or croutes in Western-style soups).